So when Autism on the Seas announced that they were doing a ship-tour nearby, coupled with a discussion of their services, we jumped at the chance to both window-shop and hear about something that might make it possible. At first blush, it seems honestly either too good to be true, or that there have to be significant catches. The idea of a company that organizes trips on cruise ships’ regular sailings, sending along people with experience dealing with children with Autism… and in a fashion that’s affordable. But… on the other hand, we also live close enough to a cruise port that it’s also an option that doesn’t involve flying, and if you really think about it, a cruise ship is basically a floating hotel, so it’d just be the matter of driving there and checking in and… well, nothing’s ever that simple. During our wait, we had a chance to talk to the staffers who were there that day. AotS’s staff are all volunteers, and have professional experience with children on the Spectrum – one was even a prior therapist for a child whose family was on the tour with us. I have to say that gives me a great deal more faith in the people who accompany the cruises. 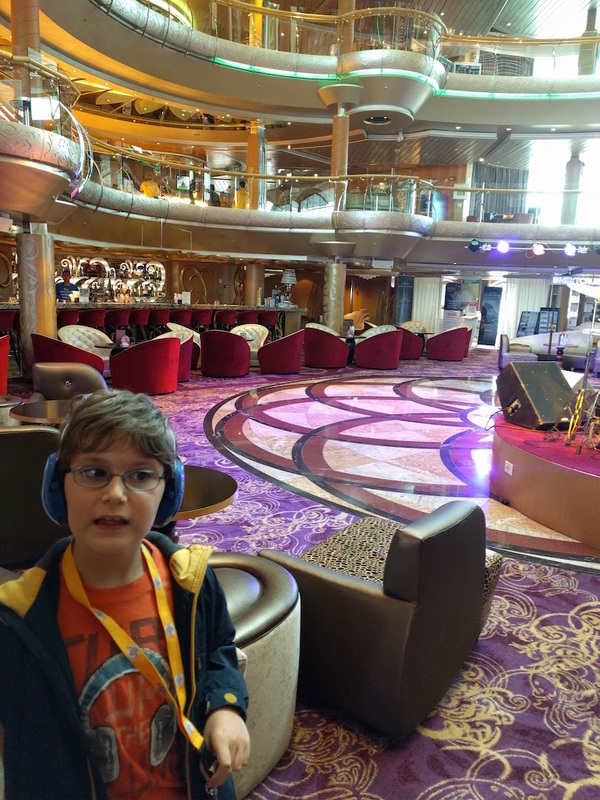 The tour of the ship was a lot of fun itself – we’ve never had the opportunity to see the variety of cabins aboard a cruise ship, and this was a good chance to try to figure out what was available and might work with our kids. (It’s a lot different when you’re cruising as a couple by yourselves, and when you’re doing it with two children.) More important was our opportunity to watch the Monster and see how he responded to the spaces aboard the ship, and he seemed alright with most of the cabins we looked at. Throughout our wandering through the ship, both by elevator and stairs, the staff were very receptive to answering questions, including minor ones (like whether a private muster drill would be held for their clients – yes), and major ones (staffing’s usually somewhere between 2 and 3 children with special needs to one staffer). For us, we do have two kids, one who’s NT and one who’s not. We did ask about availability of the kids’ club for both kids, and the answer is that if the Monster can go there, they’d set it up so that they’re called first if there’s an issue. Otherwise, they have use of a conference room where they do some separate activities, and often have anything specially themed in the kids’ club brought in for their children. They also offer help at mealtimes, and offer some respite during the evening, so that parents can enjoy later shows too (look – a vacation, not just a trip! ), and staffers can be hired privately for extra hours in the evening as we understand it (though you have to handle those arrangements yourself with the staffer). I think the proof’s in the pudding – we’ve put in for a couple of quotes for trips that look appealing to us and work with our schedule. We might actually pull off a family vacation next year. If you’ve thought about taking a cruise, and been worried about how to handle a child with special needs on it… check AotS out.